Richmond, Virginia / April 11, 2017 – Stone’s Office Equipment, a leader in office technology sales and service solutions, announced today it has received the CompTIA Managed Print Trustmark™, a respected industry credential that signifies its adherence to best practices for technology service delivery and customer interaction. “Earning this credential identifies Stone’s Office Equipment as a business that meets or exceeds the best business practices the IT industry has to offer,” said Nancy Hammervik, senior vice president, industry relations, CompTIA. The Trustmark was developed by CompTIA, the non-profit association for the information technology industry, in collaboration with industry experts and leaders, to identify businesses that have made a commitment to the highest levels of integrity and sustained quality service. The Trustmark is designed specifically for technology businesses offering on-premise print services via a managed services business model. To earn the CompTIA Managed Print Trustmark, Stone’s Office Equipment was evaluated on the internal practices and procedures they use to run their business and the external activities and operations they engage in with customers and prospects. Visit CompTIA Managed Print Trustmark to learn more. Stone’s Office Equipment, founded in 1970, is a provider of Sharp, Xerox, Lexmark and HP print devices. With offices in Richmond and Fredericksburg, we cover all of central Virginia. 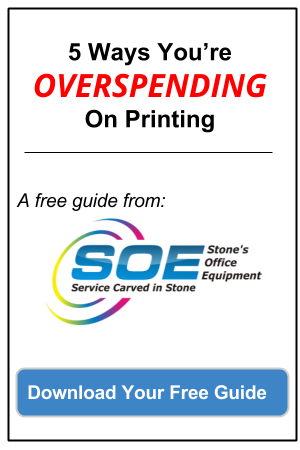 Stone’s specializes in assisting customers with unreliable, inefficient or obsolete office print technology through extensive fact finding processes to match the correct product to the clients’ needs.